The John Barnard Gest Family Papers were the gift of Lillian Gest on April 22, 1983 (Accession #: 4-83). The John Barnard Gest Family Papers are organized alphabetically. Three generations of the Gest family attended the University of Pennsylvania from the mid nineteenth to early twentieth centuries, and were active members of the Philadelphia legal and banking communities. John Barnard Gest (1823-1907) received his A.B. from the University of Pennsylvania in 1844, studied law under Charles Ingersoll and was admitted to practice in 1847 – the same year he received his A.M. from Penn. As a lawyer, John Barnard ran an active private practice specializing in real estate, patent and insurance law. He returned to the University after the opening of the Law School, receiving his LL.B. in 1852. John Barnard entered the banking world in 1873 when he was appointed vice president of the Fidelity Insurance Trust and Safe Deposit Company in Philadelphia. He would stay with the trust company rising to the position of president in 1890. John Barnard married Elizabeth Purves in 1852, and together they had four children: John Marshall, William P., Alexander, and Lydia. John Marshall Barnard (1859-1934) also studied at the University of Pennsylvania, receiving his A.B. in 1879, A.M. and his LL.B.in 1882. Admitted to the bar in 1882, he specialized in Orphan’s Court cases, and was eventually appointed as judge of the Orphan’s Court in Philadelphia in 1912. John Marshall married Emily Baugh in 1888, and had a son Sidney, and a daughter Margaret. William P. Gest (1861 – 1939) attended the University and received his AB (1880), AM and LL.B (1883), and an honorary LL.D. (1932). After admittance to the bar he practiced in a private firm, and was associated with his brother John Marshall. William entered banking in 1889 as assistant to his father, and eventually rose to the position of vice president in 1900, succeeded his father in 1915 as president, and was chairman of the board following the merger with the Philadelphia Trust Co. in 1926. William married Isabel Thorne Howell in 1894, having two daughters – Isabel and Lillian. John B. Gest II (1892-1974) was the son of Alexander P. and Kate Gest. He attended the University of Pennsylvania, graduating with a B.S. in Mechanical Engineering in 1912, and his LL. B in 1921. During World War I, John served in France as a second lieutenant of engineers with the U.S. Army. After the war, John took up a career in law, serving as deputy city solicitor in Philadelphia, and in several private firms. Sydney Grier Gest (1896-1973) the son of John Marshall Gest, entered the University of Pennsylvania as a member of the class of 1919. With the outbreak of World War I, Sydney was one of the University’s “Fighting Five” who enlisted in the United States Marine Corps. Starting out as a private, he was promoted to second lieutenant and received the Croix de Guerre and the Distinguished Service Cross for actions in France. Sydney studied law at Oxford University in England after being discharged from the Marines, and eventually served in the United States Foreign Service. Lillian Gest (1897-1986) was the daughter of William P. Gest. She received the A.B. from Vassar in 1919, and her A.M. in Social Work from the University of Pennsylvania in 1931. Lillian was a longtime civic worker in Philadelphia. Forbidden to take a job by her parents, she first started out as a volunteer at the College Settlement, and went on to become the vice president of Philadelphia’s Children’s Aid Society. 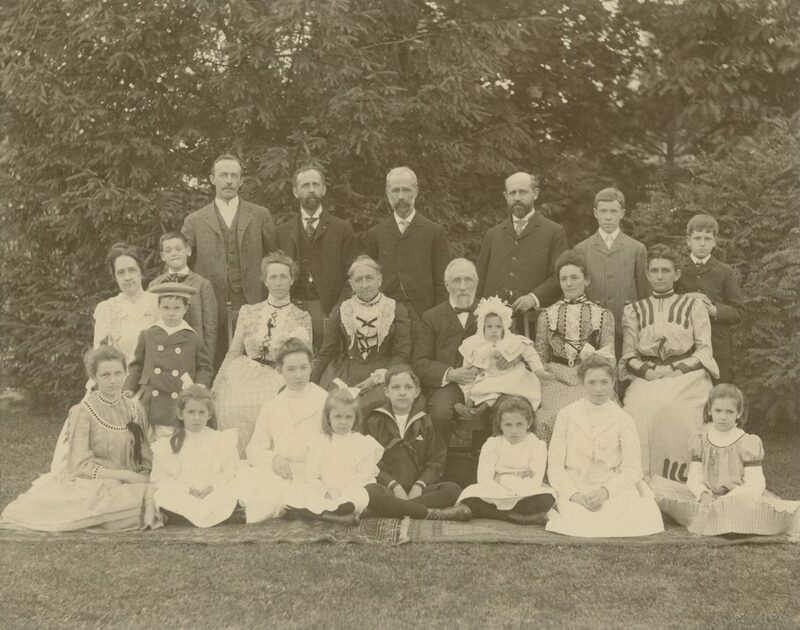 The John Barnard Gest Family Papers consists of photographs of the family – mostly individual formal portraits from the 1880s through to the early 1900s.There are a few family group images – mostly from John Barnard and Elizabeth Gest’s Fiftieth Wedding Anniversary in 1902. In addition there are typescript copies of letters from Sydney Grier Gest and John Barnard Gest II related to their World War I service, and copies of publications of William P. Gest. Gest, Elizabeth Ann Purves Photograph n.d.
Gest, Isabel Thorn Howell Photograph n.d.
Gest, John B. at Fidelity Trust office Photograph n.d.
Gest, John B. Photographs n.d.
Gest, John Marshall Photograph n.d.
Gest, William P. Photograph n.d.